This plugin allows you to apply certain noise-related develop settings automatically, in bulk, based upon the camera that created each image, and each image's ISO sensitivity and Lightroom exposure boost. Most people will find it most convenient to apply bulk settings immediately after import, and/or after a rough exposure-adjustment pass through just-imported files. That's a really busy, densely-packed dialog (sorry), so let's look at the top a bit closer. Only the configurations for cameras used for photos selected when the dialog is invoked are shown, though the plugin will remember your settings for all configurations over time. Raw photos (including DNGs) have a separate configuration from JPGs and other non-raw photos. In the example above, two Nikon D4 configuration tabs appear because both raw (NEF) and JPGs from a Nikon D4 were selected. The entire camera-specific configuration can be enabled or disabled with the checkbox at the top of the configuration. Each is configured in the same manner which is why the closeup above only bothers to show the first. Note: on smaller screens, a less verbose presentation is used for all sections other than the first, to allow everything to fit. The initial screenshot above is an example. Though the presentation is less wordy and descriptive, the meaning of each dialog component remains the same. In any case, though each control is configured in the same manner, your develop needs and tastes will likely mean that the values you enter differ from control to control. If you've enabled the “only when at its default value” option, a control won't be touched by the plugin if it's not at its default value. The intention is to leave prior changes alone. If a develop control is to be updated, its new value is computed from three things: the ISO speed value used by the camera during capture, and any “Exposure” and optionally “Shadows” added in post processing within Lightroom. ... you give a pair of ISO values that define an ISO range, and a pair of control values (in the example above, luminance noise reduction values) that define a range to use for the develop setting. Photos with ISOs less than the lower end of the ISO range don't get any ISO-related develop-control change. Photos with an ISO above the upper end of the range get the maximum of the control-value range. Any ISO value in between gets a control value from the control range. Then, on top of that, any in-Lightroom exposure compensation or “Shadows” can add additional control strength. Configuring the plugin settings for any particular camera involves perhaps more of an artistic sense than a technical one, but I'll offer some general suggestions you might use as a starting point, for when you haven't yet built up a sense of what you want for any specific camera. With the top section, I've configured it to put at least a little luminance noise reduction (5) for all images, topping out at 50 for ISO 4000 and above. The "4000" here is very dependent on the sensor and how noisy it is at high ISO, so for your own settings at least look at the stated nominal range of your camera's sensor. If you don't yet have a sense of how the sensor behaves, a good starting point here might be about &frac23; of the nominal top ISO. Color noise reduction gets a much less heavy hand, as Lightroom's default seems to be pretty good to me, and in cases it's not, I feel it's something that needs to be tweaked carefully by hand. Personally, I'm a fan of the sharpening mask, which disables sharpening in low-detail areas where noise shows up more readily, such as clear sky, so the sample configuration above reflects that with a fairly aggressive value (50) even at a low ISO of 1000. I don't personally use the Contrast or Clarity sections. I said before, the settings are highly dependent on the camera and your personal taste, so if you use these settings as a starting point, be sure to play around and experiment. A discussion of (a prior version of) this plugin in a pro-photographer workflow is seen at sidecar: post in “Parameter Based Noise Reduction – Part 1”. Added a bunch of debug logging. Add some extra debug logging. Oops, previous update about merged DNGs was too aggressive... skip only HDR DNGs (don't skip merged DNGs that are panos). Try to make the dialog fit more screens... something seems up lately with how Lightroom reports retina screens to the plugin, so this is sort of a blind fix. Added an option to skip merged DNGs, and turned it on by default. 20160402.55 Allow larger ISO-sensitivity values. 20160401.54 Shift into short-screen mode a bit more aggressively. Added an option for a hard-upper-limit cap to the settings, so that values are never set beyond them. There was a bug in the computation related to how increased shadow effected settings. Allowed the Ev/shadow-related adjustments to be percent based. Throw everything into a scrollable view on really short screens. If an image didn't have an ISO speed value, the Ev-related items wouldn't be applied. They are now, independently. Redesigned the dialog, and gave each of the controls (luminance noise reduction, color noise reduction, and masking) its own ISO range. Added the ability to update the contols depending on the amount of negative shadow applied. Added the ability to update Contrast and Clarity as well. 20141019.46 Windows Only: Add a one-time check for the POODLE security vulnerability, and alert the user if it exists. 20140710.40 Sigh, had a bug in the Creative-Cloud support. 20140704.38 Sigh, introduced an error for some folks with the rebuild the other day. 20140216.33 Squelch an error that popped up if you canceled the import-settings dialog. 20131014.32 Found that with certain settings some math errors would pop up. 20130704.31 Added the ability to set/clear keywords based upon bulk-develop processing. 20130613.30 Better support for plugin revalidation. 20130328.25 Fix for the registration system. 20130316.24 Switched ISO interpolation to logarithmic, which should provide for more-balanced results. Linear interpolation, which the plugin used to do, is still available as an option. 20130201.20 Update to my plugin build system. Holy cow, discovered a bug (thanks Cody Sims!) that could cause appropriate bulk settings not to be updated, depending on what order what settings needed to be applied. This was a huge bug with a major impact on some kinds of shots... I can't believe that I never noticed this one myself... I use this plugin myself with every photo I take. Just dumbfounded, but glad it's fixed. The plugin was leaving cruft in one's "Plugin Develop Presets" folder; now cleans it up. In Lr4, images with PV2012 were being processed with the Exposure from the prior process version. Doh! Added the ability to export and import settings. 20120309.14 Update to the debug logging to better track down timing issues that might arise. Add a bit of bullet-proofing against corrupt catalogs. 20120119.10 added some extra debug logging to try to track down a bug. Added extra debug logging, when “enhanced logging” is selected in the plugin manager, to try to debug an issue. 20110912.4 Added the ability to update the sharpening mask. 20110401.3 Big update adding support for color noise reduction, and the segregation of non-raw and raw. Best to make a backup of your catalog before trying this update, just in case. 20101104.2 Reissue after a build change. 1. Please make the fields “per +1EV added” and esp. “per +10 shadow adjustment” customizable. Reason: For my low-noise full frame 6d, the default produces too high values. It’s nice to have the option to have the nr adjusted for +ev/+shadow, but I often raise shadows a lot which catapults nr through the roof esp. on low iso with the fixed (minimum) rate value of 1. 2. Rather than using a *fixed* +ev/+shadow rate added on top the iso-dependent nr, imho using a percentage might be an alternative like “+1%”. I know a tool like this cannot generate spot-on values, but the same fixed rate for iso 100 or 12800 is not elaborate enough atm. thanks for the plugin and I find the new version a great addition. But the Add per +10 shadow adjustment, seems not to work like I expected. Have a picture with +70 on shadow, the increments are 2/1/1/0/0 but after applying the values the change is 26/34/49/0/0 on the values. I expect a change 14/7/7/0/0 could you please check or explain this? Hi, nice job ! But I miss a feature which would be nice : allowing – for instance – to decrease Sharpening Mask while the ISO rise. As it, there is a red alert but the “OK” button remains inactive. Is there a reason for not allowing this ? I try to come to terms with “Bulk Develop”…. Do you have any suggestions for settings of “contrast” and clarity? Whe I use your tool in the “library” and “select all”, not all of the selcted pictures are affected. Maybe only the 13 or so pictures that are actually shown on the screen. When I “isolate” the pictures, which were not developed, I can apply “Bulk Develop” a second time and they now are shown “developed”. Hi from Italy. I have donate some money for your noise plugin. It’s great. I’m working with D4s and D810 in water polo indoor. Can you suggest how set up develop settings ? This looks like one of the best damn plug-ins ever, but I think I must be missing something. Even as a professional photographer, I don’t know the optimal settings to apply in order to get the best noise reductions for a range of ISOs, especially as each parameter/category relates to the one before (they just say 0 ~ 0). I’ve looked through your documentation for settings or a link to recommendations (I know they also change according to the camera being used), but can’t find anything. I also see an “Import Settings” button, but of course that’s what I’m looking for – the settings. I’m seriously looking forward to getting this up and running but I don’t want to just give it my best guess. I am a big fan of your plugins and I use a lot of them, all registered of course. Formerly I used Rob Cole’s Iso detailer for importing my EOS camera files int LR because I can also alter the sharpness settings wit his plugins. Lately Rob’s support and development on his plugin stopped working, any change you will add Sharpness settings to the Bulk Develop Settings plugin? I am trying out your plugin with the latest version of Lightroom CC (2015.3), but for some reason the sharpening amount is not being applied. The luminance and color seem to work correctly, but the sharpening stays fixed at 25 regardless of ISO. I really appreciate all of your work and have purchased two plugins so far, and this will be my third with more to follow. Is there a quicker way to access the settings for Bulk Develop (and also for Folder Status) instead of going the File > Plug-in Extras route? Thank you. I found that the plugin doesn’t allow me to input ISO bigger than 99999. I tried to input 102400 but it auto change it to 99999. And since A7S’s response is pretty linear (according to http://www.dxomark.com/Cameras/Compare/Side-by-side/Sony-A7S-versus-Sony-A7R-versus-Sony-SLT-Alpha-99___949_917_831), I should really be entering 409600 and let the plugin extrapolating all the values in between. Do you mind raising the ISO limit of the plugin? Thanks. By the way, the website said I can use `a href…` but when I do, like this: <a href="http://www.dxomark.com/Cameras/Compare/Side-by-side/Sony-A7S-versus-Sony-A7R-versus-Sony-SLT-Alpha-99___949_917_831" title="DxOMark" rel="nofollow">, it is the text after the hyperlink got hyperlinked. This plugin is awesome! I use a lot of your plugins but never noticed this one. I decided to search for something to set noise reduction based on iso and this went way beyond what I was expecting to find! Thanks so much, I’m going to donate now. Would love to see Profile Correction option so can enable it when doing the bulk develop as it would save another step. great plugin like said before. I have a “Problem” with using 10 as the Default Color noise reduction for ISO 100-400. I made ISO specific Default profiles in lightroom and set the Color noise reduction in the plugin at 400. But the plugin will Change the ISO 100-400 Pictures too, sett them to the 25 Default of Adobe. Would it possible to leave the values for the Pictures below the plugin start Setting value (<ISO 400)on there already set value? Great plugin – been using it for ages and it’s just what I need. Am just wondering if there is a problem with version 20160402.55 – it seems to be ignoring my ISO Range settings (400-6400) and also applying adjustments to photos in the range 100-400. I’ve never had this issue before – am I missing something obvious or is there a small bug in this version? I just tried this Bulk Develop Settings plug in and am very pleased. I have been wanting to set-up unique default development settings based on camera & ISO – to be applied at import. This tool allowed me to do so. I created a collection of virtual copies of .dng files with one example of every possible ISO step from 50 to 51200, applied the plug in to all of them and then set the default develop settings for each ISO setting. And was able to do this for primary and back-up camera. May even do so for my iPhone. 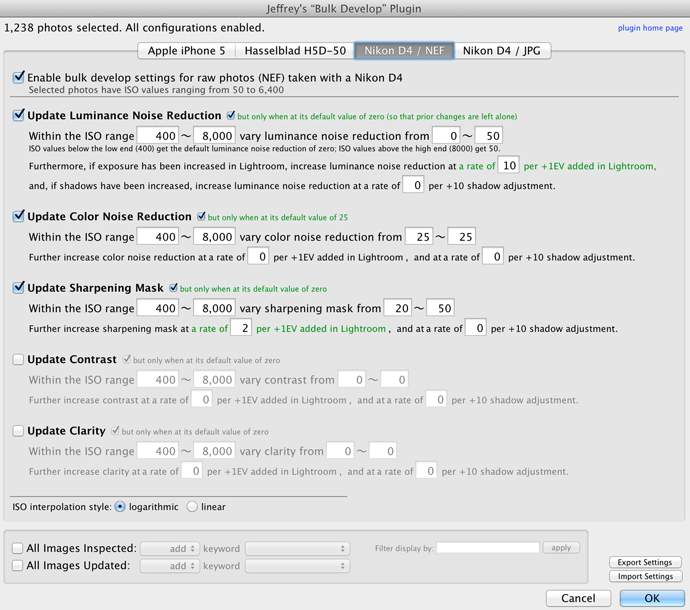 Question/Clarification: I set the tool to apply NR values for ISO range of 400 – 51200. However, the tool is still applying NR values on files with ISO values in range of 50 – 360. I thought they would have been excluded. I verified three times… Am I missing something? I’ve problems on my Levono Yoga Pro 2 with a display resolution of 3200×1800 pixel. When I switch to a resolution of 2048×1152 pixel everthink is visible. it works ! Can’t see a difference in Lightroom, but the plugins menu is now completely visible ! because of the updates you are providing for the others plugins I’ve registered. Great Work – Thanks a lot ! I think you’re right Lightroom seems to look different on the high-DPI screen now. I’m trying to setup a keyboard short cut for the bulk develop plug-in on the Mac but having no luck. Other shortcuts for LR menu items do work but when using either ‘Apply Bulk Develop Settings…’ or the same but no ‘…’ as the menu item to apply the short cut to, it just doesn’t work. Is there some special trick to create shortcuts for plug-ins? REF: LR 6.7, OSX 10.11.6, last 2016 version of the plug-in. That did it! Thanks Jeffery…. I am interested in this plugin however in Lightroom I use 2 sliders for Noise Reduction (NR) in the NR box: Luminance and Detail. I usually put Detail at 0 and increase the Luminance slider until the noise disappear. Then I increase the detail until I achieve the desire effect. As far as I can see this Bulk Develop plugin only operates on the Luminance slider ? How does it work with the Luminance Detail slider ? 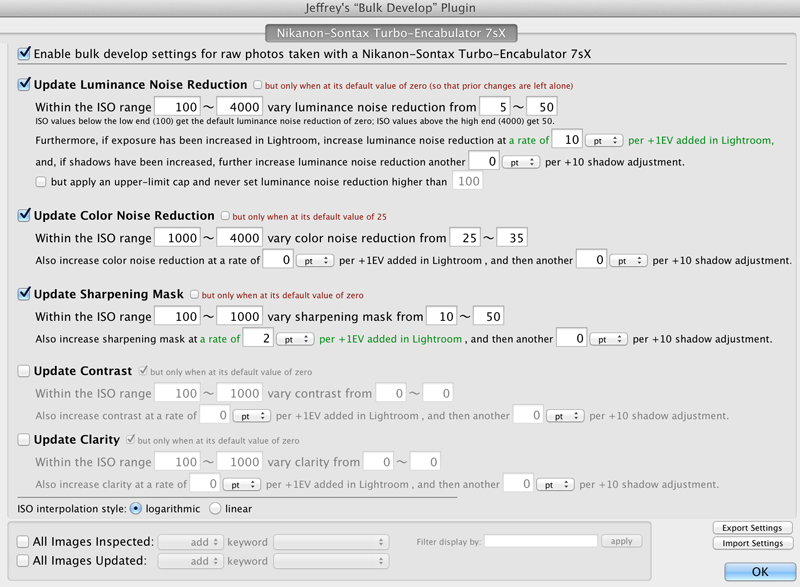 Hi Jeffrey, amazing plugin. It’s wonderful. I was wondering if you’d be adding a function for tone curves in the future? I regularly use tone curves to futher lift the shadows which means the image needs more needs more noise reduction. Thanks! We love and rely on this plugin! We just upgraded from 5D iii to 5D iv…does anyone have any recommended settings they use? For the meantime I switch back to the older version. I set luminence noise redution to adjust images that are between 2000-13000 ISO, but images well under 2000 ISO also get adjusted. Did I do something wrong, or is this a glitch in the software? Well. The plugin doesn’t seem to be working properly. I have an image from a d750 with iso 500. Default color correction is zero for this camera. I’ve set a rule of iso 800 to 25600 to apply color reduction from 1 to 35. The plugin is applying 25 when it shouldn’t even touch this setting. Why? Love this plug-in and have been a happy user for a few years. It seems like the introduction of the new profiles is causing something weird to happen – every time I apply noise reduction settings in bulk my color profile switches from Adobe Color to Adobe Standard. Any idea what is happening there? Hi, I’ve updated LR Classic to version 8, updated the plugin (since my current version stoped working with LR 8), tried to enter my code but it said “Registration code already used for a different Lightroom serial number”. Although I’m using the same LR on the same macbook pro, just updated LR. Do I need to purchase plugin again in order to make it work with LR 8?